Cats have a pretty good sensor that alters their nervous system and triggers severe levels of anxiety. Most of the cat owners face this situation when they have to take their cat to vet for regular checkups. They also tend to get worried when they see medicines. If your kitten has a history for previous traumatic experience, you must know that your kitten gets anxious whenever something triggers its memories. If your cat does not have proper socialization, it gets worried when you take it out, or any guests visit your home. Believe it or not, the aging brain in cats experiences different stages of anxiety based on their age. Aging brain suffers from problems like memory loss, dementia, and pain that results in anxious behavior. 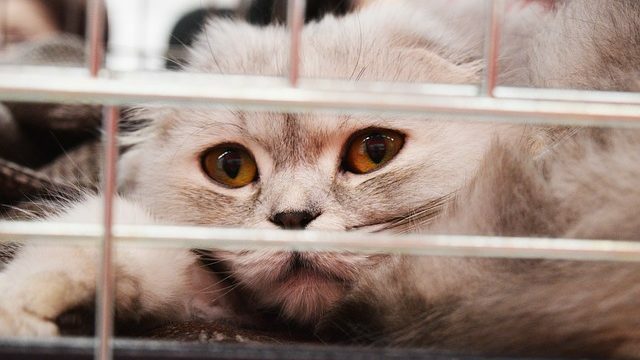 It would irritate the mental condition of your cat if you failed to keep up the daily things like placement of litter box and feeding habits. One of the most common causes of anxiety in kittens is welcoming new stuff to your home. If you have purchased any furniture recently or bought any new things for your home, your kitten needs some time to adapt to the newness. It also includes bringing a new baby or pets to your home. Yeah! Cat has a great fear of separation, and your cat becomes stressed when you are out of sight or at work. It might be just the right hour shift for you, but for your cat, it is going to be the toughest hours. When you leave her home alone, she suffers from the pain of abandonment and increases the stress levels. First, you need to understand the symptoms of an anxious cat. Typical Anxiety in cats symptoms are inappropriate urination, increase the amount of scratching, shouting and excess vocalization. Cats are naturally anxious and act upon their instincts. Whether you are taking it out for a walk or driving your kitten to the vet, it always behaves stressful, and you can understand the tense moment. When your kitten is driven crazy with anxiety, it pees outside of litter box, runs everywhere and does a lot of nasty stuff. An unhappy cat also twitches its tail in the air to show warning signs of anxiety. An anxious cat mostly tends to hide under crouch or sofa to make herself invisible to the outer world. It makes herself smaller and sits in a corner where she can be less visible from all the potential dangers. Some cats even run away from home due to extreme levels of anxiety. First, find the position of your cat and proceed to the next step. Your instincts might tell you to hug her and stroke her with your arms instantly but do not go for it. A stressful cat can scratch you and even bite you with it feels threatened. Most of the human beings think that hugging and petting an anxious cat relieves it because people feel comfort from hug and cuddles. Experts say that it is a common mistake cat guardians does! An angry cat forgets everything and gets into a defensive mode so be a little careful around your cat and give her some space. Let her do her own thing in her space but keep an eye on it. Cats love to hear from the person they love, so sit and talk to them. Give her some sign that you are around her in the tense moment and your presence will make her feel protected. Create safer surroundings for your kitten so that it can understand that there is nothing around it to stay scared. Most of the cats get anxious when you purchase something new in your home, when someone visits your home or when they find someone different in the surroundings. Create a safe hiding space for your kitten so it can hide under it without feeling threatened of foreign particles. Build a cat tree, cute basket room, couple of boxes, and corner spots for your cat to retreat your kitten. According to cat psychology, they are more likely to run away from the danger and hide under a safer and darker place to make themselves invisible. Your kitten might prefer a place that is higher and cozier spot until they feel safe again. Let her interact on her terms and do not force her to come near you forcefully. Understand the body language of your pet and take it as a signal to move forward. Believe it or not, pet treats make your cat feeling nervous breakdown. One of the most popular methods about how to calm an anxious cat is offering it delicious pet treats. Calming pet treats are manufactured to support the mental health and nervous system functionary in the cat’s brain which eventually calms down the tensed nervous system. You can use these treats daily or in times of stressful moment. Pet treats are considered to be one of the natural remedies that help your kitten to fight against a kitten. There are wide ranges of pet treats in the current market which are offering different types of flavors. Cat treats are made up of ingredients that helps to decrease anxiety in feline. If you are using these treats for the first time, try something that has chicken, fish, and turkey. Calming pet treats consists of ingredients like L-theanine, Biopeptide blend, C3 Blend or Colostrum calming complex Biopeptide Blend. All these supplements help to reduce anxious feelings in the animals. They have filtered mixtures of fatty acids and proteins which promotes calming sensations in the anxious brain activity. Give your kittens these treats whenever it needs and be careful with the number of dosages and keep in mind not to overdose your kitten. Surprisingly, Catnip works like magic when it comes to an anxious cat. Most of the catnip tends to work as a stimulant and not as a relaxant. While many cats act high due to the effect of catnip but it’s only for a short amount of time. Giving a little amount of catnip makes your cat jump around, but it quickly settles downs the anxiety and helps your kitten to recover from the anxious symptoms. Due to the effect of catnip, your kitten gets into natural exhaustion, and you can take advantage of it. If you are taking your feline to the vet or planning to go anywhere, planning any events in your home or changing something around your house, give her a little dose of catnip about 20-30 minutes. It will naturally run off all the amount of energy and helps your kitten to stay calm in stressful conditions. It relives your cat from temporary upset moments and keeps it good. Use organic varieties of herds and put it in a toy. Hand it to your cat and avoid any overdosage. Pheromone sprays are well-known as cat spray which are made in the lab to induce pheromones artificially into the cat which triggers the relaxation in the cat. Pheromone is a natural hormone in the kitten’s body which helps in the reduction of anxiety. You can directly spray it on your kitten’s bed or any other places where it hangout most of the time. Pheromone sprays have a success rate of 90% in cat calming and known as the best calming aid for cats. Earthing is also known as grounding is also one of the best ways to calm an anxious cat. But you need to take extra care while performing this step because if anything goes wrong, your cat may feel more stressed. Earthing is a simple process of reestablishing a connection between natural energy and the cat’s body. Earth emits different waves of electrical charge, and when these waves pass through our body, it automatically shows the effect nervous system. When your kitten comes in direct contact with a naturally conductive surface like sand, stone, water it will work within 20-30 minutes. Take your feline outdoor or indoor where it can sit or sleep on the bare ground. You can also get grounding sheets or pads which brings the energy in the Earth naturally. First, try the grounding pad by yourself to transfer your scent on it, so the cat feels less threatened. Sprinkle a little amount of catnip on the pad for better results, and that’s it sees how things changes quickly. Introducing your kitten to various stress relieving toys is a great way that ensures your cat feels less stressful. Install a cat flop or cat tree around your home that makes your kitten play around forgetting about the anxiety. Playtime tire the cats and do not let it feel low, Schedule some time to play with your furball and never forget to cuddle with it whenever you have some time. Give her some toys and allow them to feel free to play with you. You can try toys like cat balls, furry mice, stuffed toys, feather strings that quickly grabs the cats attention. ‘When you are going to bed, never forget to spend a couple of minutes with your cat to get relieved from the day time stress in yourself. Last but not least, be patient and do not get angry when things go wrong. Performing any shouting or being rude to your cat when your cat is feeling stressed only makes things get worse. Shower your feline with all the love and take good care about her. Stay positive and be more friendly with her. So, here are the ways about How to calm an anxious cat. Understanding an anxious cat behaviors helps you to get the problem solved quickly. A stressful cat needs love, care and attention to keep calm. Stay safe and Love cats!